Kitchens are not simply a place to cook food, they have truly become the heart of the modern family home. The way in which each family uses their kitchen is slightly different, so when it comes to buying a new kitchen careful thought must be put into each aspect of its use. Kitchens are likely one of the biggest purchases you will ever make and it is not a decision that should be rushed. Any new kitchen needs to satisfy you from both a practicality and aesthetics point of view, it’s important to imagine yourself in your new kitchen, making changes afterwards is often not possible. 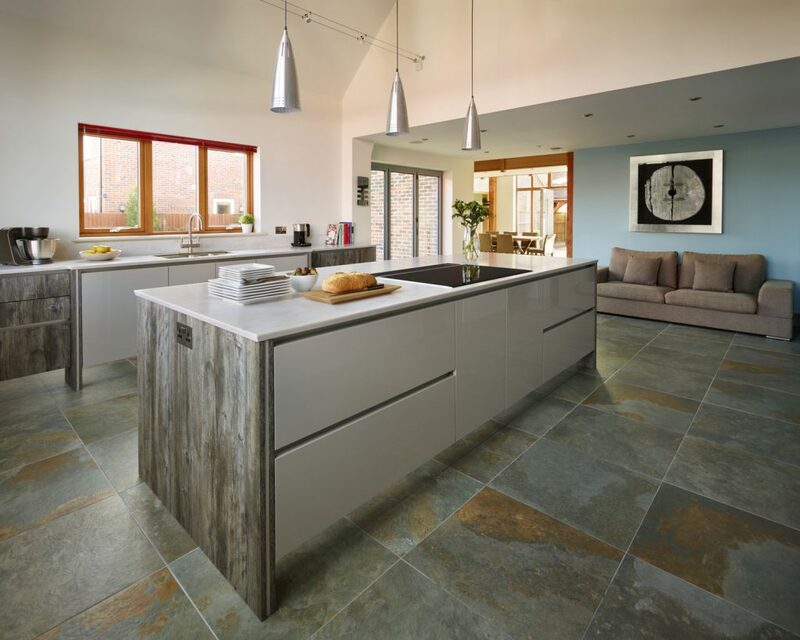 Whether it’s cooking breakfast or cooking roast dinners you need to imagine how you’re going to use it on a daily basis, but also what kitchen style will complement your home. You need to gain inspiration and see real kitchens and how they look in the flesh. This is where the kitchen showroom comes in. 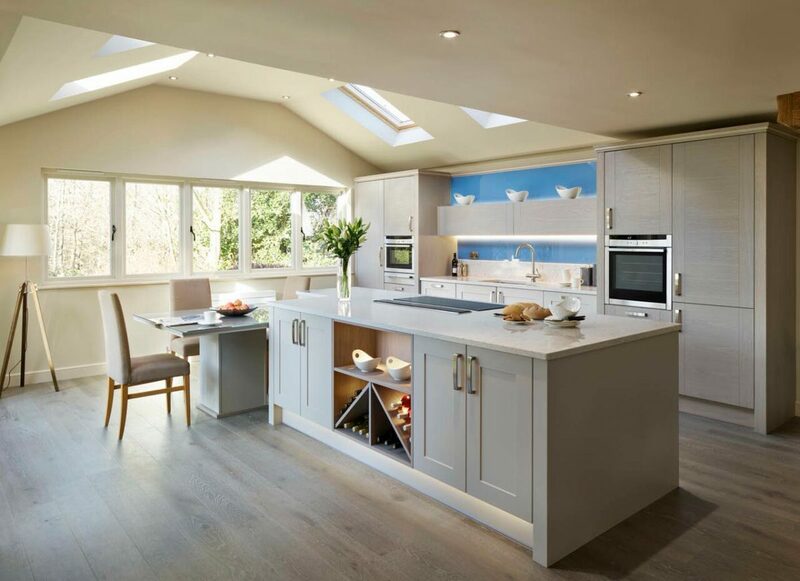 Our kitchen showrooms play a vital role for our customers, helping them to imagine their dream kitchen and giving them inspiration. You’d never buy a car without test driving it, so why should you buy a kitchen without getting at least a flavour of what it’ll be like. We always produce 3D visualisations of kitchens, but this only goes so far to helping you imagine your new kitchen. In an age where everything is moving online, kitchen showrooms remain a key asset for us kitchen retailers. Looking at a picture of a kitchen online may help you gain inspiration, but it is simply no substitute for touching and interacting with a real kitchen. Draws need to be opened, cupboards need to be shut and surfaces need to be touched, kitchens are tactile environments that need to be interacted with. Visiting a kitchen showroom is part of the experience in buying a designer kitchen, it’s essential for building that picture of what kitchen you’d like in your home. Our showrooms are a very important part of our business and will remain so for many years to come, but they have a limitation. We need to showcase multiple kitchen options within a small amount of space, meaning that we are often limited to half-size kitchens. However, we have come up with a revolutionary solution which is unique in our industry, taking the essence of the traditional kitchen showroom and evolving it into something better. We’ve developed The Kitchen and Bathroom Experience Centre. 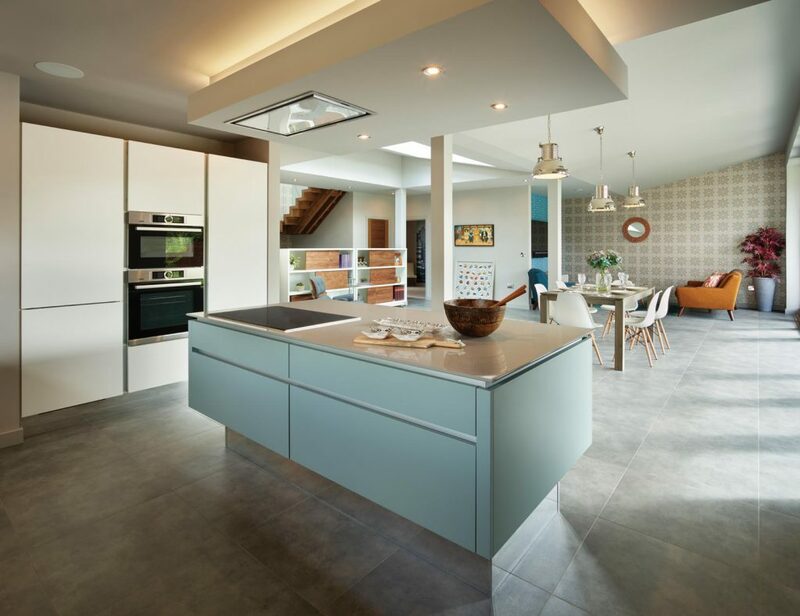 Based in St Neots Cambridgeshire, and in partnership with the Potton Show Centre, the Kitchen and Bathroom Experience Centre enables us to present our kitchens and bathrooms in several varieties of full-scale home environments, giving you an even greater feel of how the kitchen will look in your home. At the show village, we have everything from a charming cottage inspired home, through to a very modern minimalist styled home. 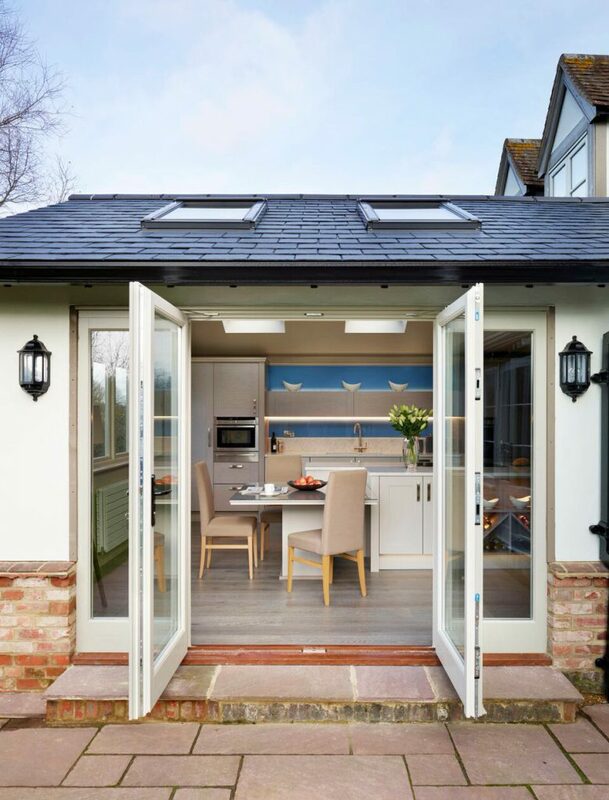 You can wonder through the stunning houses and see how the kitchens and bathrooms are designed to fit the character of the house, filling you with inspiration to create your dream kitchen and bathroom to go with your home. We have experienced staff members based at the Experience Centre all week long, ready to answer any questions or begin working with you on your new kitchen or bathroom project. The extra space we have available at the Experience Centre means we are able to run regular events. One such event we run on a regular basis is our Design Your Perfect Kitchen and Bathroom event. This event takes place several times throughout the year and features experts from NEFF appliances to showcase the latest technology. Take a look at the Cambridge Kitchens and Bathrooms events page to see our upcoming events. In an industry which can often be slow to change, we believe the Kitchen and Bathroom Experience Centre offers a breath of fresh air. We’ve made a long-term commitment to the Experience Centre, we’re currently working on installing a new kitchen within Potton’s recently renovated Milchester house, a project which combines modern materials and techniques with traditional Georgian architecture. Due to launch in March 2018, we’re very excited about unveiling this to everyone. The next step beyond this is creating your kitchen using virtual reality and letting you wonder around a virtual creation of your kitchen. This is something that we have been experimenting with, but the technology is still in its infancy and is a long way from being reliable and coming close to matching seeing the kitchen in the flesh. However, we’re continuously exploring these options and you can be sure that when it comes of age, we’ll be there at the forefront. If you’re interested in visiting our Kitchen and Bathroom Experience Centre, please visit the Cambridge Kitchen and Bathrooms Experience Centre page on our website, you can book an appointment or you can book onto an event. Alternatively, you can email us at [email protected], or call us on 01480 877274. We’re easy to find too, located in the market town of St Neots, less than a mile from the A1 and only a stone’s throw from Bedfordshire. This article was recently written for the KBSA consumer blog, their blog post can be seen here.